Synapses, connecting the neurons in our brains, continuously encode new memories, but the ability to form new memories (“learning”) diminishes drastically for many of us as we get older. Electron micrographs revealed the alignment of the plasma membrane, with evident increase in extracellular spacing between cellular elements, to be affected in 30d w1118 flies, when compared to 3d or 30dSpd w1118 flies. 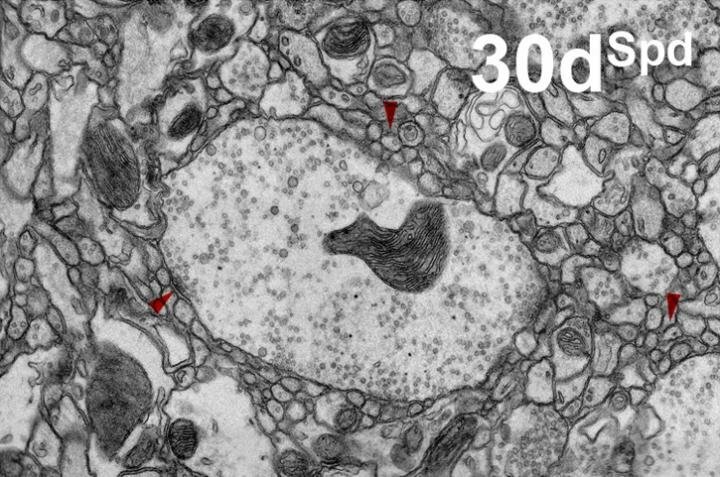 In an article published September 29 in open-access journal PLOS Biology, work by the groups of Stephan Sigrist from the Freie Universität Berlin, Andrea Fiala (Universität Göttingen) and Frank Madeo (Universität Graz) now shows that specific changes at the level of synapses directly provoke age-related dementia, and that, however, administering a simple substance already found in our bodies, spermidine, can help to avoid such age-related synaptic changes and thereby protect from age-induced memory impairment. Just like humans, the fruit fly Drosophila melanogaster — a leading model for aging research — suffers from memory impairment with advancing age. The same team of researchers previously observed that Drosophila exhibits an age-induced decline in levels of spermidine, and that these memory deficits can be suppressed by feeding with a diet supplemented by spermidine. They now describe an unexpected scenario that convincingly explains the suppression of memory deficits by spermidine feeding. In a nutshell, synapses within the Drosophila brain seem to narrow their operational space, and thus become increasingly unable to form new memories with age. Dietary supplementation with spermidine, however, prevented these changes. Importantly, when the authors mimicked these age-associated changes by genetic means, learning suffered even in young flies, providing a causal link between generic synaptic mechanisms and age-induced memory impairment. This work promises to open up a new avenue when searching for new therapeutic strategies to fight age-associated dementia, a major health threat of our times.